View cart “Digital Multimeters Classroom Set of 10” has been added to your cart. Catalog number PL-CS. A classroom set of pencil leads, with 12 each of HB, H/2H and 6H leads. 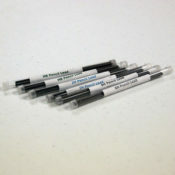 These replacements are for the Pencil Lead resistance board found in the single Resistance Boards kit and classroom set of 10 Resistance Boards. Catalog number W05-CS. 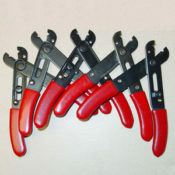 Five-pack of wire strippers. Essential accompaniment to the Batteries, Bulbs and Switches materials and Simple Circuits products. Catalog number SCK-01. The Simple Circuits Kit is designed to teach students about voltage, current, resistance, series and parallel circuits in Unit 2. Electrical Circuits of the Exploring Physics Curriculum App. With the Simple Circuits kit a group of two or three students can perform the following activities in Unit 2. Electrical Circuits of the Exploring Physics Curriculum App. Catalog number RB-02. This kit includes one set of equipment to conduct two experiments in Unit 2. Electrical Circuits of the Exploring Physics Curriculum App. This kit is perfect for a small group of two or three students. The Resistance Boards are used for the What Causes Resistance? Lab where students investigate the parameters that determine the resistance of a wire. 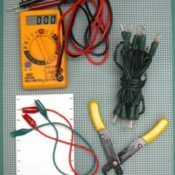 The Ohm’s Law kit is used in conjunction with batteries and multimeters to conduct the Ohm’s Law Lab. Assembly required. Replacement pencil leads sold separately. 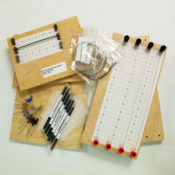 A classroom set of 10 Resistance Boards and Ohm’s Law kits is also available. Batteries and digital multimeters are available from several vendors. 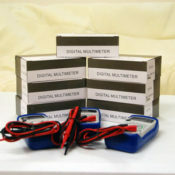 Ten-pack of economy digital multimeters. Essential accompaniment to the Batteries, Bulbs and Switches materials and Simple Circuits products. Catalog number SCK-CS. 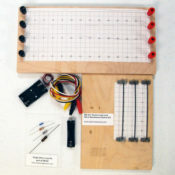 The Simple Circuits Kit is designed to teach students about voltage, current, resistance, series and parallel Circuits. The classroom set contains materials for 10 students to conduct activities in Unit 2. Electrical Circuits of the Exploring Physics Curriculum App. With the Simple Circuits kit your entire class can perform the following activities in Unit 2. Electrical Circuits of the Exploring Physics Curriculum App. Catalog number R20-CS. 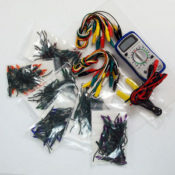 This classroom kit includes 10 sets of equipment to conduct two experiments in Unit 2. Electrical Circuits of the Exploring Physics Curriculum App. This kit is a perfect size for your entire class. Assembly required. Replacement pencil leads sold separately. Batteries and digital multimeters are available from several vendors.